The Catalina Cassina Cushion is embroidered on a woven cotton, in circular Suzani motifs and is finished with a hand-stitched blanket stitch along all sides. The reverse of the cushion is a plain woven cotton. 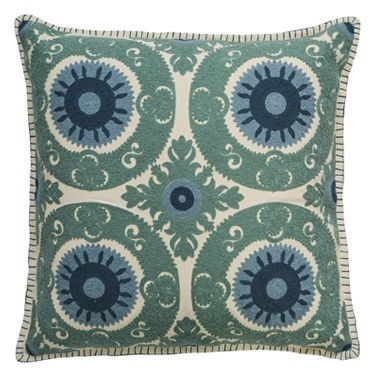 This cushion explores traditional Suzani-inspired motifs and techniques creating a range that is reminiscent of Indian textiles, but with a modern twist.